Note from Ben: my wonderful wife, Melanie, recently wrote this as a personal tribute and “thank you” to those veterans closest to our family. She’s taken to doing more writing of late to share personal stories with our kids both now and in the future, and I am always touched by the words she crafts to explain emotions, feelings, and more. Sharing here with her blessing. For 20 years, I selfishly thought as Veteran’s Day as just another day. Another day to miss school and/or work. I remember the day I received the call. I was in Scottsboro cheering Ben on as his brothers and he competed in a triathlon. My phone rang and it was my mother telling me that my dad had received word that he would be sent to Iraq for a year, possibly longer. I broke down, went and hid in the restroom, and thought of nothing more than my father’s safety. The time that led up to his deployment was hard. We tried to fit in a lot of family time, but we also kept dreading the day we would have to send him off. Eventually, we all gathered at the airport, hugging him tightly. Then he boarded his plane and was gone. We coped as best we could. We stopped watching the news, avoided newspapers, and continued to pray for his safety. We received letters, emails, phone calls, and pictures. Technology has come so far. We didn’t have him home, but we heard from him often. Thankfully he remained safe during the full term of his deployment, but things at home didn’t go as hoped. His mother was suffering from cancer, and we knew her days on earth were numbered. 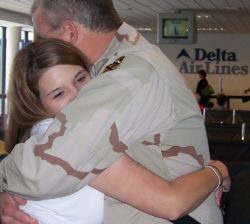 He received personal leave to come home, but when he arrived, she no longer was responding to us. She soon passed away. Also during this time, my sister had to have an emergency c-section due to preeclampsia. My niece was born not breathing, but was revived. 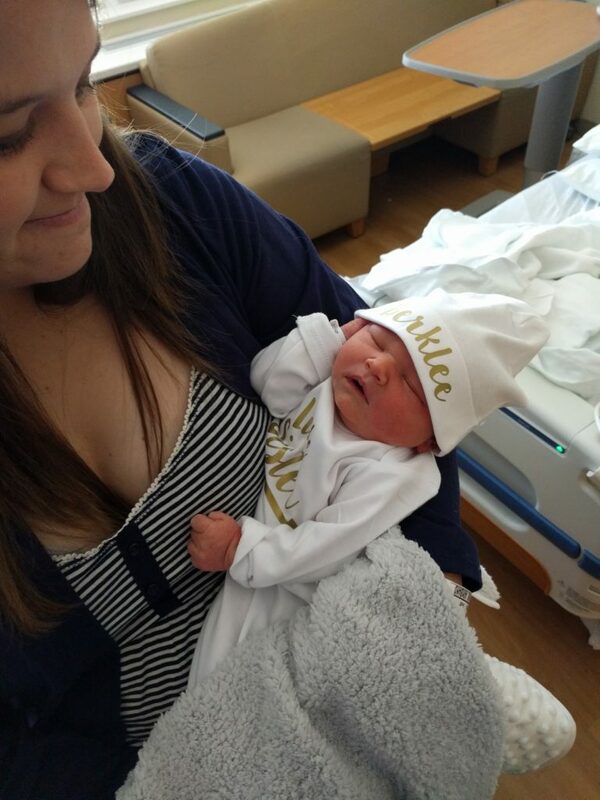 She was taken to a NICU at another hospital while my sister recovered in the ICU where she delivered. Things were very scary. We kept these details from him until we knew they were both going to be okay. My point is that not only are our military men and women put in harm’s way, they miss so much family time when they are away. Instead of thinking of today as just another normal day, make it a point to thank a Veteran. To those veterans both stateside and abroad, we thank you for your service from the bottom of our hearts. This entry was posted in General and tagged Personal Life on November 12, 2018 by Ben. A few weeks ago you probably caught my letter to my unborn child. This last week has been a wild ride as we added Berklee to the family, surprising about 95% of the people we know because she was NOT a boy. Melanie and the baby are doing great, and the other kids are overjoyed at having the baby at home. This entry was posted in General and tagged Personal Life on November 21, 2016 by Ben. Going way personal today. Take it or leave it, but I always write what moves me. Thanks! We are so very excited to meet you. I’ve been going back and forth between nervousness and excitement over the past few weeks, because I know that you’re going to make your appearance within the next few weeks. One day you’ll read this with a smile. I don’t usually share my personal life with the rest of the world. It’s just not the way I do things, and I would be willing to bet that you are going to share some of those introverted tendencies. What’s funny is that I can jump on stage and talk about anything, but when it comes to small talk and meeting new people I am much less adept. I’ll try to teach you both as best I can so that you are able to overcome any challenge or take advantage of any opportunity. You are incredibly special to us and (as far as we know) will complete the vision we have had for our family since we met almost fifteen years ago. Did you realize that your mom and I met in high school and instantly fell in love? Yes, we had no clue what “love” meant at the time, but it has grown with us steadily over the years, allowing us to grow our family along with it through a variety of means. There are many things that I plan to teach you, whether you’re a boy or a girl. I’ll teach you to make funny faces, even if the time isn’t the most appropriate. Laughter is medicine, and I happen to be an expert in it. We’ll do handstands and cartwheels. I’ll show you how to walk on your hands and we’ll laugh together when we fall over. I’ll show you how to cook. We’ll have adventures in the kitchen making things that sound crazy but just might be delicious. We’ll explore the outdoors. I’ll teach you about all kinds of fun things like the sun and how it works. I’ll gladly answer all kinds of off-the-wall questions like why the sky is blue or why frogs don’t have tails. We’ll learn together. I’ll teach you to fish, and how to sit quietly together even when there’s not a fish around for miles. I’ll show you what it means to live by faith, not by sight. I’ll instruct and guide you so that you grow up to love others, not judge them. This is one of the most important things that I need the time to help you understand. I’ll show you these and a thousand other things, because it’s my job. But it’s also my pleasure. My treat. My sheer joy. Your mom always laughs that I get along with kids so much because we’re on the same wavelength. Maybe it’s true, but I have yet to be crippled or hampered by that fact! You’ll learn in time that I’m not perfect, but you’ll also see that love can overcome so many imperfections. Little one, please know that you are loved, treasured, and desired. I can’t wait to meet you and we all look forward to this new adventure. This entry was posted in General and tagged Personal Life on October 17, 2016 by Ben. I’ll start off by saying that it’s very difficult to put into words what this experience was like and how much it meant to me. 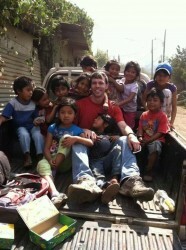 It will be a long time before I realize all the impacts of my trip to Guatemala. For now I’ve just laid out a timeline of events, because that’s much easier to write at this point in time. 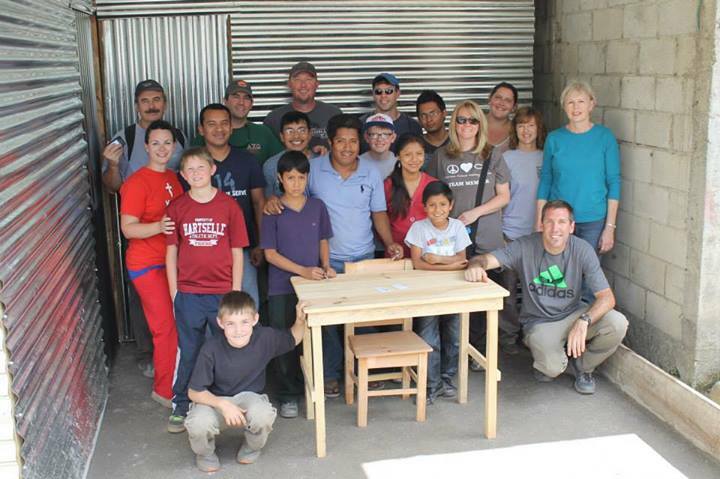 Back in November I was attending my small group at church and a friend mentioned that the mission team to Guatemala was short by a few people. I looked at my wife and we quickly decided that I would go. I have wanted to for a few years, but one excuse or another would pop up and keep me from committing. On the flip side, I have worked with our team at church to put on the annual holiday auction for the past few years. That annual event funds the feeding center and some of the other ministries within Guatemala, so I definitely had a significant interest in checking out what all the efforts had led to over the years. I spent the next few weeks puzzling through my brain. Why was I going? What did I have to offer? To be completely honest, the thought of building a home was daunting. My skills are limited to “lift that” and “move this.” I’m not savvy with my hands when it comes to projects like that. I knew I wanted to spend time with the kids and just play and love on them, but what else could I offer? Why was I supposed to be there? 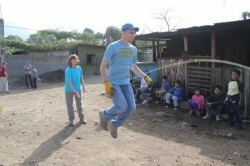 Fast forward to the end of December, and I was stepping onto a plane to head into Guatemala. I had spoken with a few previous visitors to get an idea of what to expect, but it was still a wide open canvas just waiting to be painted. The plane ride was a quick hop from Huntsville to Atlanta, then a three hour flight from Atlanta to Guatemala. We arrived on a Saturday afternoon and spent the evening resting and unpacking at the mission house located in San Pedro las Huertas. On Sunday we got up, got ready, and went to a church service. The entire service was in Spanish, but they were very excited to have us there visiting, so they asked a few people to come up and speak to the group. Our music director also got up and sang two songs, which they enjoyed immensely. I speak some Spanish, but I couldn’t keep up with everything being said. However, when the pastor bent his head to pray, I heard, “Gracias” at least a dozen times in his prayer. I heard a great quote recently that this reminded me of: What if you woke up tomorrow with only the things you were thankful for today? Take a moment to think on that. It’s pretty powerful. I do know that I’m going to be more thankful for everything, even something as simple as being able to drink water from a faucet without risking an illness! After church we ate and went to the building site to prepare the area for the home we planned to build throughout the week. We dug holes, set posts, and filled them with concrete to dry overnight. As it got dark, the family we were building the house for brought us food and drinks as a “thank you” for our efforts. It was amazing to me that this family was so giving (food for 7-8 guys is a lot), even when they had so little to give. 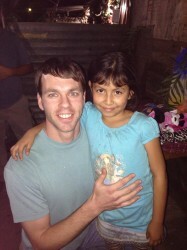 That night, I walked with a few of the team down to visit Elsa, the sponsored child of one of my good friends from home. Elsa’s eyes were enormous as she opened the small box and marveled at the toys, lip gloss, and other trinkets inside. It was an honor to be able to make that visit on behalf of my friends, and I know she and her family appreciated the gift very much. Monday we started early on the house. We started putting up the walls and roof. When you think “house,” this probably isn’t what comes to mind. This was basically a tin shed with a wood frame. However, by local standards, it was a fairly nice house. After we ate lunch and worked on the roof, I took a few minutes to wander out to the nearby area where the children were playing. I absolutely love children, and I wanted to spend some time playing with them while I was there. I started swinging them around and letting them jump from the back of the truck into my arms, and it was my favorite few minutes of the entire day. Within minutes, the kids were saying, “Mono! Mono! Mono!” I couldn’t help but laugh, because that’s Spanish for “monkey.” Soon it was time to head back to the mission house, so I had to tell the children that I would be back the next day. On Tuesday we had to mix concrete to pour floors for the home. That involved shoveling sand and gravel and then mixing that with cement and water. All in all, it was a tough job, but certainly something that someone with my level of hands-on skills (i.e. zero!) could do without much fuss. After we got the floors poured, some of the guys began building the doors that we would put on after the floors set, so I wandered outside again to see the kids. As soon as my head popped outside, they started shouting, “Mono!” and ran to me. I was swinging them and laughing, and then one little girl started saying, “Mono loco!” If you know how I act around kids, that’s a pretty fair translation: crazy monkey. Again, I spent as much time out there playing with kids, learning names, and taking pictures before we headed back for the night. On Wednesday, we couldn’t return to the house as the floors were setting, so we went to the feeding center. 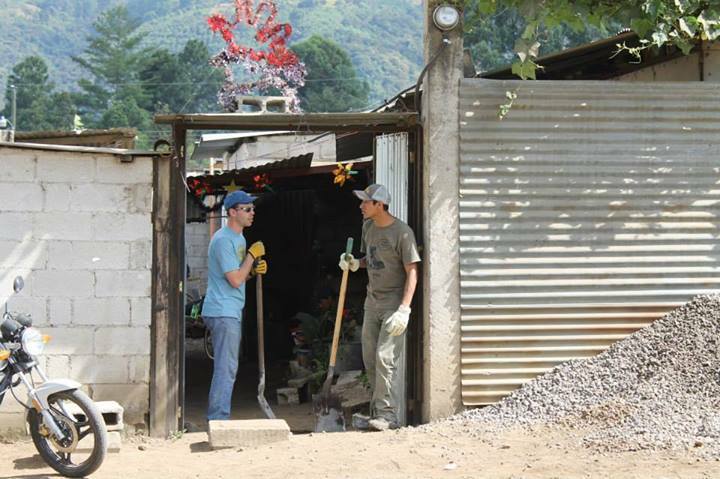 Over the past few years mission teams have built a feeding center on the side of a mountain at San Cristobal el Bajo. This feeding center provides one meal, a vitamin, and a bible verse each day to over fifty children. For many of those kids, that is the only meal they will receive all day. The feeding center kitchen had a dirt floor, and to improve the conditions and make it more sanitary, the team mixed and poured a concrete floor in the cooking area. My only regret was that the feeding center was closed for the new year/holiday, so we didn’t get to see the children who normally visited the facility. On Thursday we returned to the home to put on the doors and dedicate the home. After that special occasion was celebrated, we all had a chance to go out and help with Vacation Bible School for the children living in the squatter’s area. As we helped the children make their crafts, one of the boys brought his and gave it to me as a gift. It was incredibly thoughtful and I will treasure it! It was our last time to see the kids before we would leave on Saturday, so we gave extra hugs and said our tearful farewells. 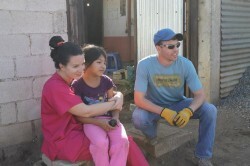 That afternoon, we made several home visits to sponsored children. 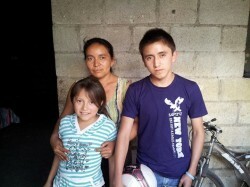 It was especially exciting for me, because I got to meet with Cesar, our sponsored child. He is currently in his “career” level classes in school, and despite the language barrier I was absolutely thrilled to get a photo taken with him. As I was leaving, his mother handed me a few old photos of Cesar. The translator asked if I needed to return them, but she just smiled and told me to keep the photos. That small token of appreciation was so special! Later, we stopped by another home to visit other sponsored children. I was able to deliver yet another gift on behalf of our friends, and it was such a neat experience to see Francisco Javier get excited about the small toys and other goodies in his box. Friday was our “off” day, after spending several days mixing concrete, pouring floors, doing construction, and going nonstop. We got to visit some interesting places around town, but for me the entire day was overshadowed by the upcoming departure. That night we hosted a youth group meeting for the local church and did some fun/funny skits and songs for them. On Saturday morning we packed up and hit the road to head to the airport in Antigua. There were many hugs and kind words spoken, and I will not forget thinking about how we were heading back home and the others were heading back to the village to rest up for another day of ministering to the local children. Amazing. This experience is difficult to describe in a few words, so I tried to give an account of the trip with some solid detail. However, I still can’t convey the lifechanging impact of the visit. I am anxious to return, and I hope to one day bring my family with me to visit the amazing people in Guatemala. Hope you enjoyed the story! This entry was posted in General and tagged Personal Life, Random on January 12, 2014 by Ben. This entry was posted in General, Video and tagged Personal Life, Random, Video on November 24, 2010 by Ben.